Last week we posted a piece about Mike Libecki and Angie Payne's ascent of 3,264-foot Poumaka on the island of Ua Pou in the South Pacific. 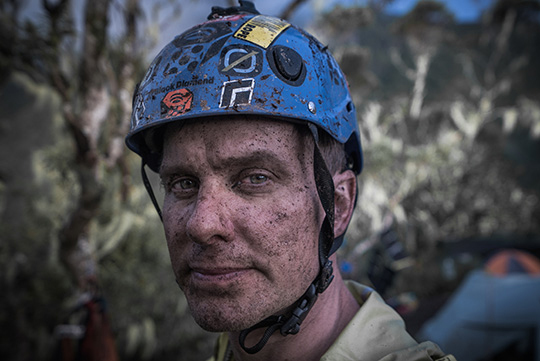 Here, Chris Van Leuven interviews Libecki to find out more about the expedition and his personal background. When Mike Libecki heard about the mysterious rock towers of Ua Pou back in 2007, he was enchanted by "folk tales about ancient glowing orbs on pointy rock summits in the South Pacific," he wrote in his blog. 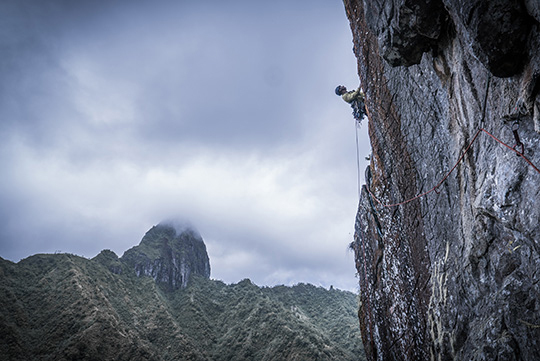 In 2013 he got his first views of the jungle and spires of Ua Pou, but constant rain prevented him from starting off the ground to make a solo ascent. He returned a few years later with professional boulderer and sport climber Angie Payne, who had never jugged a pitch in her life, to climb the tower. Libecki's falls included a grounder and a daisy chain fall directly onto the anchor. One could call muddy cracks and constant sopping conditions a form of suffering, but Libecki describes it as part of the process. "It's not really suffering if it is hoped for, obsessed about and self-induced. It's better described as pre-joy, because whether pre-joy or actual joy, there's always some form of joy."—Ed. Clovis, California. I started climbing when I was 17 or 18, senior year of high school. How did you end up in Yosemite? I ended up there because of my grandparents. When my grandfather (Harold) was fourteen, he ran away from Raleigh, North Dakota, hitchhiked and took trains, and worked there for five years and did forest jobs. He chose Yosemite because he'd seen it in a photo. He was a pretty burly dude—one of fourteen children. My grandparents grew up on farms. I think the age of fourteen then would be eighteen or twenty now. I started climbing my senior year in high school. I didn't have a lot of support from my family. I went and saw my grandmother Bertha. She encouraged me to pursue my dream of climbing. She was my biggest inspiration and supporter. Why do you use the Chinese zodiac theme on your trips? [That] started in 1997, when we wore tiger suits to the summit of Denali. It's a great reminder to always stay a kid. If there is no sense of humor, nothing is worth it. Do you have siblings? Do they climb? I have a younger and older brother. My younger brother went to Greenland with me and didn't climb, and then to the Tian Shan in China, up a 2,000-foot tower. It was his first time climbing. The next year, he went to Kyrgyzstan with me, and he and I did a 3,000-foot route. His only two climbs are pretty proud. He learned to tie in at the base of the wall [in Tian Shan]. Why do you pick partners, like Angie or your brother, who've never done a wall? It can get emotional and scary. I've had a few El Cap partners who weren't into it. What do you hope to bring out in people by doing big, scary things with them when they have no experience? I have a completely different approach to climbing and goals, and I want my daughter to crush it. Anyone around me, I want to see them crush it. And I expect it on an expedition, for them to give above and beyond to try to succeed on our goals. I have the same expectations [of myself]. Tell me about the time you went into a meditative state to weather a storm in Baffin Island. Do you often think back to that experience? When I climbed the Ship's Prow sixteen years ago, I went into [that] state. That was my first time being caught in a big windstorm—at least 80-plus mile per hour winds. I was camping on the frozen ocean. I brought ice screws, and I'm lucky I did: I used them to hold my tent down. My cook tent was shredded. The top of my tent was hitting my sleeping bag, and I was held in place by the screws. I basically had no choice, and focused on the now. I was really into Buddhism then and the idea of the now. It was an incredible turning point in my life about time and patience. Two days later, the storm was gone. It's stuck with me in expeditions and in life: patience and optimism. Without optimism, nothing happens. I've been with partners who thought we would die. Me, I'm a stubborn optimist. I always find a bright side. It works. Poumaka—Was it free, aid, both? I did a decent amount of free climbing up there. We were 100 percent soaked. Your rope isn't just damp; you have to wring it out. It's just so wet and that mayhem added to the challenge. One pitch had twenty-plus Beaks. It was solid, hard rock; just some of the cracks were filled with mud. I took three healthy falls. There was an aid fall off the anchor, and I took two free-climbing falls [when] the roots and plants [I was grabbing] failed. It was one of the most fascinating climbs I've done. I was so psyched because it was the ultimate mystery. Tell me about your previous trip with Angie. Angie and I went to Greenland together in 2012; she had a tough time there, but we connected really well. I offered to help her expand her climbing [skills]. I warned her, "If you go [to Ua Pou], you'll probably wish you weren't there." [Once there] she showed real emotion. I was enthused to watch her push through her walls of fear. She'd never jumared an aid pitch before, never cleaned a pin before. Right when we started the climb, she didn't know what was normal and what wasn't. How did she react when you hit the ground? On the first pitch, I took a twenty-foot grounder. She freaked out. I pulled one piece and was runout. It was new rock to me. I told her, "Hey, don't worry, everything's fine. This is not normal." It was huge [fall into] jungley soft bushes. What style did you climb in? We fixed several pitches and then made a 25-hour push for the summit. On the last pitch, Angie was really gripped. It was howling wind and raining and dark. Once she got onto the summit, she was so psyched. It was cool to witness her pushing through and coming of age. I'm headed to Africa in a few weeks with my daughter.